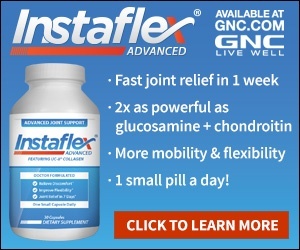 Thanks for all the review on whats up with Instaflex. Good ingredients but havent tried. Instead I am checking out : http://www.vedaliving.com/product_info.php?cPath=40∏ucts_id=123 for arthritis. They have other arthritis products and the price is much better. all wild crafted organic herbs and ancient medicine which is where Instaflex is getting its ideas. The maker is an Aruvedic doctor from India continuing an ancient tradition of medicine. The food recommendations are a little confusing unless you are Indian. They also have herbal oils for arthritis that I like. I am just starting on joint health but what to try some others. anyway an alternative. Review #210964 is a subjective opinion of User210964. instaflex is operating a scam ,,, just to run up your credit card..